Years ago, while serving as a Dean at UCLA and shortly after my first book was published, I had the pleasure to call Carlos Castaneda my friend. Carlos, the author of the famous and esteemed Teachings of Don Juan books, told me that Don Juan, a Yaqui sage wizard, always reminded Carlos that wherever you are it is important to be conscious of where you put yourself in that place. And even after Carlos’s passing, that lesson has remained with me. While gurus will tell you to know where you are in your life at any moment, and advisers and coaches will tell you think on this when you are going in for a job interview, what chair to sit in, what window to sit by, Don Juan’s advice is no less relevant when we travel. In any city you would hope to know and embrace, and perhaps grow to love, it is important to think on where you want to stay, where you will sleep, what you will wake and see. 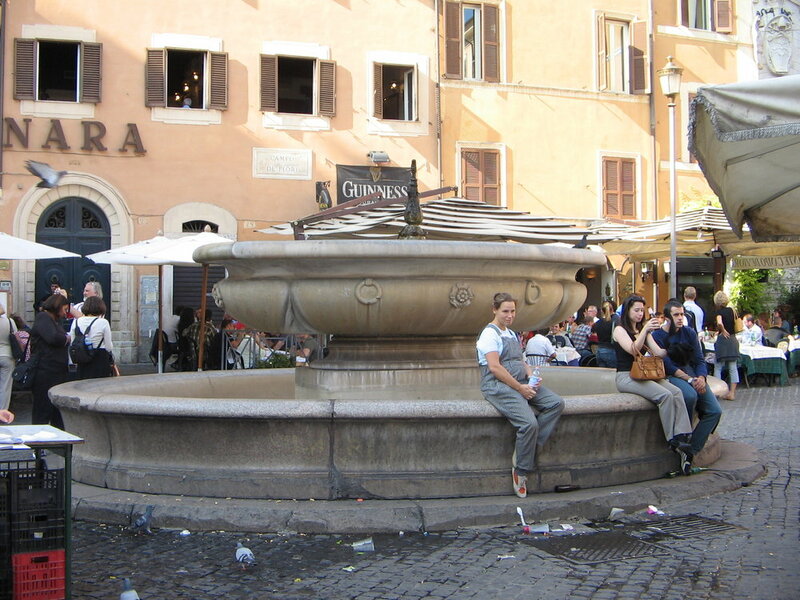 For me, in Rome, that answer is a no brainer – Campo dei Fiore. Campo dei Fiore is a piazza where the flower of youth and flower sellers make music with their chorus of vita e buono, life is good. And life is better than good here, it is bravo, great. Under a midnight moon this is magic. Since 1869 a daily vegetable and fish market has been held there, which before took place every morning in piazza Navona. The ancient fountain known as la Terrina (the “soupbowl”) once watered cattle, was resited in 1889, and replaced with a copy: This now keeps flowers fresh. On it is the inscription: FA DEL BEN E LASSA DIRE – “Do the good and let them talk.” At night, Campo de’ Fiori is a meeting place for tourists and young people coming from the whole city to bars, restaurants, and small shops. Okay, now here is a little of what might be called the travel-guide info on Camp dei Fiore: Campo de’ Fiori is a rectangular square located south of Piazza Navona in Rome, a few blocks from the Tiber river and the historic and grand main Synagogue of Rome, a ten minute romantic walk to the dine-a-thon of Trastavere, and twenty minute back alley stroll past the Pantheon to the Spanish Steps. And yes, you can, even on cobble-stone streets find your way to the Vatican. But while all of above is factual and interesting, it is only information. The heart of the information is that Campo dei Fiore has a heartbeat that beats in time with my heart. I wake to the smell of fresh flowers, tantalizing cheeses, and bakeries that steal my heart. I return “home” after walking Rome for six hours and feel at home. My home in Campo dei Fiore is Hotel Lunetta. Again, here is classic travel info on a classic hotel that’s foundation has been around for 2,000 years, or more: Hotel Lunetta, a source of “light,” is a completely modernized 4 star luxury hotel located in the building of an ancient hostel built on the remains of the walls of the Theatre of Pompey, in the year 68. On the eastern side of the building, in the direction of Largo Argentina, there was the ancient Curia where Julius Caesar was killed in 44 B.C. Okay, now that you’ve got some of the facts, let me tell you what beckons me beyond the facts. To start with, it’s Anna. When my wife and I arrive at the hotel, we meet Anna and Anna’s smile. Smiles always translate. We arrive and feel hugged. And we’re in Rome. Now, I speak Italian, but again, being warmly and sincerely welcomed speaks for itself. My wife and I return to Italy almost every year and laugh that we eat and eat in Italy and lose weight. And the reason we lose weight is because we walk and walk. And while all of this may or may not be interesting to you, let me assure you that after a day of walking in Rome a cocktail on a terrazzo overlooking the city with the early evening breeze is heaven come to earth. At hotels in Italy the people who work there tend to stay there, for years. And so when I return to Rome and retreat to the terrazzo for my cocktail at the Hotel Lunetta, I am counting on meeting Alessandro. And when I do, it is my turn to smile. And when I look out over the city and hear the bells and watch the fading sun painting the sky, I also say a small prayer of gratitude. I am not confused. Rome is a banquet, but in this brief life, Campo dei Fiore, Hotel Lunetta, Anna, and Alessandro are digestible memories no less grand than the Coliseum, Trevi Fountain, and the Vatican. Where you put yourself in life is important; in whose company you put yourself is no less important. After accepting a cocktail on the Terrazzo from Alessandro, we took Anna’s suggestion for dinner, had outrageous tuna and swordfish Carpaccios and perfect al dente pasta, walked back through Piazza Navona eating mouth luscious gelato, slowly, slowly, and slept until breakfast back on the hotel’s Terrazzo. See me happy. And if you can make it here, trust me you will see you as happy. I promise. La esperenza e eternale!